Brigid is worshiped worldwide as a source of inspiration, protection, and blessing. In Tending Brigid's Flame, Lunaea Weatherstone presents the beloved Celtic goddess as a true soul-friend for women today, exploring her legends and lore, attributes and allies, holidays, symbols, and sacred places. 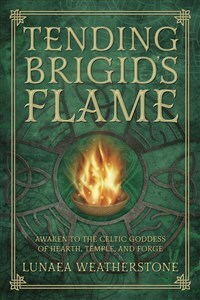 Filled with rituals, exercises, and meditations, Tending Brigid's Flame shows how to welcome Brigid into your home and make sacred all the activities of everyday life, from food magic to faery traditions, and from scrying to personal healing. Using the symbolism of fires that burn in hearth, temple, and forge, this breathtaking book sends you on a journey through the transformative power of one of the world's most revered goddesses. Lunaea Weatherstone (Portland, Oregon) is a priestess, writer, teacher, and tarot counselor who has been serving the Pagan community for more than twenty-five years, since her days as owner/editor of SageWoman magazine. As Grove Mother for the Sisterhood of the Silver Branch, she offers year-long programs in goddess spirituality. Lunaea has been working with the tarot for more than forty years.